The solitary house rises rosy-hued and defiant in the midst of a salt marsh, like a grand dame keeping up appearances. A closer look reveals a sadness reminiscent of an Edward Hopper painting—the facade peeling, plantings overgrown—an icon of a bygone era. The Pink House, as it has come to be known, captures the imagination of just about everyone who passes it along the Plum Island Turnpike in Newbury. Even local wildlife is drawn to it—snowy owls and hawks often perch on the cupola, rising above the surrounding wetlands. While the house inspires artists to paint and children to tell ghost stories, for Juliette Loring, it inspires childhood memories. It was her home for nearly two decades. “I understand the romance of the location better than anyone,” says Loring, whose family moved into the house when she was in kindergarten in 1961. In the summers, they could paddle a boat right from their backyard into Plum Island Sound, and, in winter, there was no better place for ice-skating. And, nearly year round, her favorite refuge was the unheated cupola, with the salt marsh and ocean stretching out in all directions, and low-flying planes zipping past on the way to the landing strip down the street. Not to mention dramatic storms whipping up the trees and water, making the house, all of a few feet above sea level, feel like an island. These days, the only action the cupola sees is from those birds of prey, using the high spot to hunt for field mice and rabbits. The home has been unoccupied since the early 2000s, when Loring’s mother grew too frail to spend her summers there, and the family sold it to the Parker River National Wildlife Refuge in 2011 for $375,000. Since then, speculation has been brewing, and has lately come to a head, about the fate of the Pink House. A grassroots movement launched by local residents Alison Odle, Rochelle Joseph, and Andrew Griffith has spawned an active Facebook page with more than 700 followers—a dedicated group that brainstorms ideas for keeping the icon intact, and a nonprofit registered as Save the Newbury Pink House, Inc., to fundraise for preservation efforts. 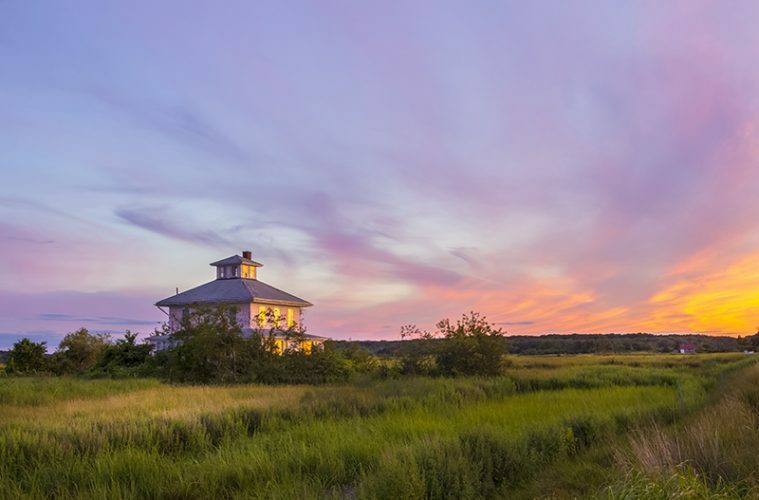 As striking as it is alone in the marsh, the Pink House stands in the way of the U. S. Department of Fish and Wildlife Service’s plan for the land. Bill Peterson, refuge manager for both Parker River and Great Bay in New Hampshire, says the parcel offers a wealth of opportunities for environmental education—the dry patch of about two acres in the middle of a wetland is just the right size for a couple of school buses. That means students could walk just a few steps and be standing in the middle of a marsh at low tide, surrounded by tall grass, buzzing insects and plentiful wildlife. Even the soil has educational value—the silt may have been carried all the way from the White Mountains in New Hampshire. “There’s no better way to learn about a natural area than to immerse yourself, literally,” says Peterson, who took over the top spot at the refuge about a year and a half ago. “Actually holding peat in your hands is better than any slide show.” But as of now, no one can enjoy that experience. The area is completely off-limits—the liability of the Pink House means access is closed to the public. The proximity of the Pink House parcel to both the road and the large and inviting refuge visitor center, a few hundred yards down the Plum Island Turnpike, is appealing to Peterson. But the structure, and its incumbent baggage isn’t—the expense of removing the house, which has asbestos and other contaminants, coupled with the community support for saving the structure, leave the refuge amenable to the idea of swapping it for something similar nearby—if the Save the Pink House group can swing it. “I’d love to find a win-win,” says Peterson, who notes that there are several parcels of land in the area that would be just as desirable from an environmental education standpoint. The challenge is for the loosely formed Save the Pink House group to come up with a unified plan—and funding—by spring, when Peterson hopes to make a decision about the fate of the parcel. While ideas have been floated about making the house an artists’ retreat, it is clear that most Pink House supporters would like to see it unchanged and unoccupied. Plum Island resident and Save the Pink House co-founder Joseph adds: “An empty house set in the landscape of such uncommon beauty certainly invites the imagination—and curiosity.” Joseph recently toured the house, with Peterson and a local builder, and determined that the building is structurally sound—encouraging news for those who want to preserve it. It’s likely that the sheer pinkness of the house is a large part of the drive to preserve it, acknowledges Parker River’s Peterson, and it’s been that color for as long as anyone can remember. Former resident Loring says the house was pink when she moved in as a small child, and her family kept repainting it the same hue. “It just couldn’t be imagined in another color,” says Loring. Loring has been surprised to see her childhood home in the spotlight. While the house had its charms, it was also rife with challenges. The property never had fresh running water, so the family showered and cleaned with brackish water, fetching drinking water at the old Newburyport fire station (now the Firehouse Center for the Arts). And occasional very high tides would leave the house cut off from the road. “The flood would come up and surround the house. We lost more than a few cars,” Loring says, before they wised up and parked across the street on higher ground during flood tides. With the Save the Pink House group only in its nascent stages at press time, no formal plans for the building are on the table, but Peterson hopes that a solution can be reached this spring that will please everyone. While former resident Loring wouldn’t say what she’d like to see become of her childhood home, she is glad it’s not up to her.